A blog from Chris Bartter, trade union writer and communications expert in Scotland, This blog is a small contribution in opposition to the right-wing consensus in the media, and will. hopefully, campaign for working people and public services. Any comments on this blog to chrisbartter@btinternet.com please. The first of my two articles reviewing this year's Celtic Connections was in the Morning Star yesterday here. It dealt with two themes, the continuing connections between British and Irish music and the roots music from the US - particularly timely given recent US events, and the remarkable standard of so-called 'support' bands in the festival. 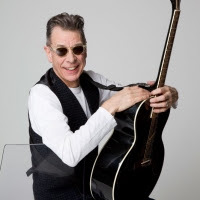 As it is likely that I won't be able to get a review of Rab Noakes' 70/50 concert at the Old Fruitmarket last night into my next, I thought I'd post it here. Noakes, who has recently come through a draining series of treatments for tonsillar cancer, was celebrating his forthcoming 70th birthday (no they didn't wheel a Gene-Pitney-style cake onto the stage, although there was one backstage apparently! ), and the 50th Anniversary of his first paid gig - at the Glasgow Folk Centre appropriately enough. He slipped onto the stage after the band, almost unnoticed until he revealed his suit! But he soon took command. The intro promised a selection of 'landmark' songs - so-called because he hasn't had any hits, he pointed out! - and new material. The former included Lindisfarne's 1969 hit, Together Forever and the song he wrote inspired by the great Scottish folk singer Alex Campbell, Gently Does It with its touching line -"you'd been on this road so long. Now they're building a highway to take you home." - a sentiment that could be applied to Rab himself. The concert was packed out, a testament to the affection that his fans have for him, an affection that was almost tangible. The concert was as meticulously crafted as we've come to expect from Noakes - albeit with a slight trip over the song order! Contemporary songs in his inimitable country folk style were prominent - four of the six tracks on the new EP. (Reviewed here) and (at least) three from I'm Walking Here. But the best of the contemporary songs were two that he wrote while getting back into his Scottish music roots. The Handwash Feein' Mairket is a song about the exploitation of asylum seekers forced into illegal work by our brutal restrictions, and what he called Tramps and Migrants - a mash-up of Bob Dylan's Pity the Poor Immigrant and the Scottish traditional Tramps and Hawkers, beautifully assisted by Gaelic singer Kathleen MacInnes. His backing band - Una MacGlone, Innes Watson, Stuart Brown, Christine Hanson, Lisbee Stainton and Jill Jackson - more than did him justice, and his voice - if a bit lower in register - has clearly not been damaged by the treatment. A beautiful 'cello treatment of the love song I always will stood out amongst the closing tunes. Rab is perhaps even better now than he was when he first hit the musical big time. He starts a short tour of UK towns in March. If you're around - get along! Chris was the Communications Officer at UNISONScotland for 20 years. Recently retired, he is currently working with FairPley Ltd. to promote the concert organised to celebrate the life and work of Tony Benn. He lives in Glasgow, with Doreen, his partner of 39 years. This blog is hopefully an attempt to comment on items of political, media or cultural significance. Anyone with interests in these topics is welcome to contact me and suggest items to cover or supply links to other blogs and websites. I reserve the right not to link or feature them though!! More history and less economics?